Stay with motorcycling long enough to swat a few gnats with your nose and you will at least begin to realise how much there is to know about spark plugs. Bikers like to tinker, and will replace spark plugs even if they don't venture anything else. And in just replacing plugs the motorcyclist becomes acquainted with the fact that there is more than meets the eye. The first thing you have to learn is that there are some important differences in spark plugs' threaded ends, which are made in four diameters and lengths. Most plugs' thread diameter is a nominal 14 millimetres, but Honda -for example- uses 10mm plugs in small displacement engines and 12mm plugs spark all the Honda Fours. There also are 18mm plugs, seen only rarely in motorcycle applications despite the advantage they bring to two-stroke engines. At one time you had to cope with slight differences in thread configuration on spark plugs from different countries; this worry mercifully has been ended by an international standardisation of thread forms. Because differences in thread diameters are so large, few people get into trouble through trying to stuff a l4mm plug into a 12mm hole -or vice versa. The same isn't true of plugs' threaded lengths, or "reach." Setting aside for the moment the small variations created by the use of an inch-based standard in a mostly-metric world, there are just four nominal reach dimensions: 3/8-inch, 1/2-inch, 7/16-inch and 3/4-inch. These dimensions are followed by engine manufacturers in the depths they give plug holes, and the idea is that the lower end of the plug's threaded shank should come up flush in the combustion chamber. We know from personal observation that people do make plug-reach mistakes; using 3/4-inch plugs in 1/2-inch holes is the most common error, and one fraught with unpleasant consequences. One of the disasters you can have from using a long-reach plug in a short-reach hole is purely mechanical in nature. In time the plug threads exposed inside the combustion chamber may become filled with hard-baked deposits. If that happens you'll find it almost impossible to remove the plug without also removing the plug hole threads. Reversing this kind of mistake, using a plug reach too short for the hole, lets deposits fill the plug hole's exposed threads and may cause difficulties when you try to install a plug having the correct reach. The worst and most immediate problem created by an overly-long plug in an engine is that the exposed threads absorb a terrific amount of heat from the combustion process. This raises the plug-nose temperatures, and may take them up high enough to make the side electrode function as a glow plug. And when that happens you have the white-hot electrode firing the mixture far too early, like an over-advanced spark timing but worse because the early ignition causes yet higher combustion chamber temperatures, which causes even earlier ignition. This condition is known as " runaway pre-ignition " and if it is allowed to proceed it will wreck your engine. Even a single plug thread exposed in an engine's combustion chamber will raise electrode temperatures quite markedly. That could be a real problem as engine makers don't hold plug-hole depths to close tolerances, and the near-universal adoption of crushable plug washers gives the user a chance to compound errors by over-tightening when installing fresh plugs. Spark plug manufacturers have solved the problem by leaving an unthreaded relief at plugs' lower ends. The relief also serves as a pilot, guiding a plug straight into the plug hole. Finally, the relief accommodates differences in opinion between plug makers about how nominal reach dimensions should translate into actual metal - and there are some small differences. Matters of thread diameter and length resolved, you can still get into trouble with a spark plug property called " heat range." All conventional plugs, whatever the application, have to stay hot enough to burn away deposits (oil, carbon, etc.) that otherwise would short-circuit the spark, and that places the lower limit for temperature at about 700 degrees F. There are multiple upper limits for plug temperature: sulphurous fuel elements begin chemical erosion of the electrodes above 1100 F.; oxidation of nickel-alloy electrodes begins at 1600-1800 F.; and at some point (which depends upon compression ratio, mixture, throttle setting, etc. ), the electrodes will be hot enough to cause pre-ignition. So, to be safe, plug temperatures must be held between 700 F. and 1000 F. over the whole range of operating conditions. If all engines, and riders, were identical, the spark plug manufacturers' jobs would be easy, as a single plug would be suitable for all applications. Instead, engines vary enormously, as do specific operating conditions, and so the plugs themselves have to be given equally varied thermal characteristics. This is done by varying the length of the path taken by heat as it travels from the very hot centre electrode and insulator nose to the relatively cool areas around the body's threads and the plug washer. Plugs with a long insulator nose, which leads heat high into the plug body before it turns back toward the cooler cylinder head, are " hot." 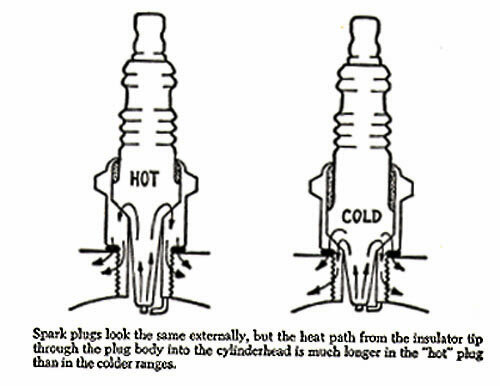 Short-nosed plugs, with a shorter heat path, are " cold." And these terms are very misleading, as in all cases the object is to match the thermal characteristics of plug and engine so the electrode temperature will stay between 700 F. and 1000 F. We must emphasise that it is the engine that puts heat into the plug, and not the reverse. A " hot " plug does not make an engine run hotter; neither does a " cold " plug make if run cooler. The entire question of heat range is something most people find terribly perplexing - and deal with simply by following the recommendations of their bike's manufacturer. But this does not always yield satisfactory results, because many motorcycle engines make impossible heat range demands. Free-air cooling broadens the range of engine temperatures; so does the typical bike engine's specific power output, which is a level encountered only in outright racing engines little more than a decade ago. Manufacturers tend to specify plugs with heat ranges chosen with an eye toward " worst-condition " operation, which means that bikes' original equipment spark plugs often are a bit cold for those who ride conservatively. Unfortunately, the conservative rider is mostly likely to also be conservative in other ways, and in most cases will stick with whatever plug his owners manual suggests; the speed merchants, who are the people manufacturers have in mind when they make their heat-range recommendations, usually assume their own bikes need colder plugs. Knowing which plugs are hotter or colder than the ones you presently have in your bike is easy if you're content to stay with the same brand. Nearly all of the world's plug makers use a number-based code to designate heat range: foreign firms follow a system in which higher numbers mean colder plugs; American companies do just the opposite, assigning hotter plugs higher numbers. Unfortunately, there is no semblance of order beyond this point. One company, Champion, is in a state of nomenclature transition that makes its product line inordinately confusing. The American Rule applies at Champion, but in an odd way, spread across three series of heat ranges that encompass touring and racing spark plugs, old and new, with double-digit numbers assigned to some and single digits for others. Bosch's three-digit numbers are a holdover from the early days, when plugs were rated for engines' " indicated mean effective pressure." But combustion chamber pressures alone soon proved inadequate, for it was found that the thermal load on a plug also depended upon spark timing, cylinder head cooling and even on the flow of mixture into the cylinder. These factors greatly complicate the business of assigning plugs thermal ratings. Each spark plug manufacturing firm has its own test procedure, and though there are efforts being made to bring the whole thing under some international standard no agreement exists today. On the other hand, there is an enormous amount of mutual product testing being done, and this enables plug manufacturers to offer accurate cross-brand conversion charts. However, it should be understood that the equivalents are not exact. When plug maker-A's chart shows " equivalents " from maker-B and maker-C it only means those are the nearest equivalents; they aren't necessarily identical. This creates a little confusion, and an opportunity: if you think a particular plug is just a hair too hot or too cold, try its equivalents in other brands. You might hit upon precisely the thermal characteristics you want. The last point of confusion in the area of heat range is the fact that the progression of numbers within a manufacturer's line of plugs may not accurately reflect the extent of the shift toward hotter or colder thermal grades. It appears that all the companies began with some neat, evenly-spaced arrangement of numbers and heat ranges, and then had to shuffle everything around to align themselves with reality. Apparently some plugs are thermally biased, hotter or colder, to make them better suited to particular applications - as when an engine manufacturer is willing to order large volumes of plugs if they're biased to suit his needs. And if one of a plug maker's best-sellers is biased colder, while the next-warmer thermal grade is biased a bit hotter, you get a kind of heat-range gap, which can be bridged only by switching brands. There is more to spark plugs than just thread diameter and reach, and heat range. Cramped installations have created plugs with stubby insulators and small-hex bodies; aircraft plugs often require strange provisions for shielding; aerospace work has brought us spark plugs that look like a death ray firing-pin. Most of the far-out variety have no conceivable application in motorcycling and can be ignored; but there are a few " special " spark plugs you definitely should know about. One very useful variation of the standard spark plug has its insulator nose and electrodes extended from its metal shell. The projected-nose configuration moves the spark gap a bit farther into the combustion chamber, which tends to improve efficiency by shortening the distance travelled by the flame front and also making the combustion process more regular. But there is a more important benefit: the projected-nose plug provides, in many engines, what effectively is a broader heat range than you get with the conventional flush-nose type. The projected nose is more directly exposed to the fire in the combustion chamber, and quickly comes up to a temperature high enough to burn away fouling deposits after ignition occurs. Then during the subsequent intake phase this plug's exposed tip is cooled by the swirling air/fuel mixture. In this fashion the higher temperatures existing at full-throttle operating conditions are to some extent compensated by the greater volume of cooling air, and the net effect is to make the projected-nose plug better able to cope with the conflicting demands of traffic and highway travel. It should be evident that the projected-nose plug's effectiveness depends on the pattern of incoming mixture flow. Four-stroke engines often have intake ports angled to promote turbulence. If the plug is positioned directly in the path of the intake flow there will be a large amount of heat removed from the plug's tip by this direct air cooling, and that is just what you get in most four-cylinder motorcycle engines. Indeed, any hemi-head four-stroke engine gives its plugs' tips quite a useful blast of cold air during the intake stroke, and we think projected-nose plugs probably should be in wider use in bikes than is the case. Two-stroke engines can benefit from projected-nose plugs' fouling resistance which they get simply through the sheer length of their insulator (it's a long way from the centre electrode's tip back up to the metal shell). However, the two-stroke's incoming charge doesn't always do a good job of cooling its plug, and you have to be very cautious in using projected-nose plugs in the valveless wonders. Some four-stroke hemi-head engines' domed pistons extend up into the combustion chamber too far, at TDC, to leave room for plug tips that extend inward. This can prevent the use of projected-nose plugs; it's something you check by covering the plug nose with modelling clay, shaping it so you have a 360-degree electrode contour, and inspecting for signs of contact after you've installed your " clearance " plug and cranked the engine over a couple of turns. Limited plug/piston clearance in certain racing engines has prompted plug makers to create the recessed, or retracted gap, configuration. Champion inadvertently did everyone a great disservice by labelling its retracted-gap design as an " R " plug: people thought the letter meant " racing " and used the R-series in all kinds of high-performance applications, which was a terrible mistake. Even if an R-plug's heat range (all are very cold) is right, its gap placement lights the fire back in a hole and the combustion process never is quite as regular as it should be. The retracted-gap plug exists only because some engines present a clearance problem; it never was intended for use where conventional or projected-nose plugs can be fitted. At one time there was a lot of excitement over another unconventional plug-nose configuration. In the " surface-fire " plug the spark gap was between the centre electrode and the flanged-inward end of the metal shell, and the insulator material filled its interior out almost flush with the electrode's tip. Surface-fire plugs don't even have a heat range; they run at about the same temperature as the combustion chamber's walls and are completely immune to overheating. Neither can they cause pre-ignition. These features were stressed at the time of their introduction, and everyone thought surface-fire plugs were just wonderful. They aren't, because they make their spark too close to the chamber wall, and require an incredibly powerful, CDI ignition system. Motorcycle ignition systems are the weak sisters of the world's spark generators. Bikes therefore need all the ignition help you can give them, which brings us to yet another useful group of special spark plugs: those with precious-metal electrodes. Conventional plugs have thick, blunt electrodes made of an alloy that's mostly iron, with a little nickel added to lend resistance to erosion. Special-electrode plugs have a side (ground) post made of ordinary nickel-iron alloy, but a centre electrode of something much more costly - which may be a silver alloy, or gold-palladium, or platinum, etc. Bosch still favours platinum; Champion, ND and NGK offer plugs with electrodes in materials ranging from silver to tungsten. Gold-palladium seems to be the alloy that offers the best price/performance advantage; we don't entirely trust silver electrodes, which if overheated will over-expand and crack the insulator nose. Platinum and gold-palladium alloys can survive the combustion chamber environment as very small wires, and in that rests their great advantage. Electrons leap away from the tip of a small-diameter, sharp-edged wire far more willingly than from one that's fatter and rounded. So the fine-wire plug requires less voltage to form a spark than one with conventional electrodes, and the difference becomes increasingly biased in the former's favour as hours in service accumulate and erosion blunts the iron-alloy electrodes. There are, of course, drawbacks with precious-metal plugs: they are more expensive, and they are very sensitive to excessive ignition advance. The overheating you get with too much spark lead effects plugs' centre electrodes before it can be detected elsewhere in an engine, and when subjected to this kind of mistreatment fine-wire electrodes simply melt. In one sense this is a disadvantage, as it means the ruination of expensive spark plugs. Seen in another way it's a bonus feature: it is better to melt a plug electrode than an engine. A final variation on the basic spark plug theme you should know about is something NGK calls a " booster gap," and is known at Champion as an " auxiliary gap." By any name it's an air gap built into a plug's core, and it improves resistance to fouling. Conductor deposits on a plug's insulator nose tend to bleed off the spark coil's electrical potential as it is trying to build itself up to spark-level strength. If so much energy is shunted in this way that firing does not occur we say the plug is " fouled." It is possible to clear a lightly fouled plug by holding the spark lead slightly away from the plug terminal and forcing the spark to jump across an air gap. The air gap works like a switch, keeping plug and coil disconnected until the ignition system's output voltage rises high enough and is backed by enough energy to fire the plug even though some of the zap is shunted by the fouling deposits. Mechanics discovered this trick; plug makers have incorporated it into some of the plugs they sell, and booster/auxiliary gap plugs work really well in bikes with an ignition system strong enough to cope with the added resistance. Such plugs more or less mimic the fast-voltage-rise characteristics of CDI systems - and offer no advantage used in conjunction with a capacitor-discharge ignition. It is necessary to know all these different plug configurations if you are to be completely successful in doing your own maintenance work, and it is absolutely essential that you know how to " read " plugs if you're dealing with a high-performance bike (whether factory-built or do-it-yourself). Sports/touring machines usually are well sorted out before they're sent to market, but even the best racing bikes seem to be timed and jetted a little off-the-mark for our fuels and riding conditions. We suspect that the laboratory-quality gasoline that some factories use in their development work warps manufacturers' ignition advance recommendations; whatever the cause, nearly all the factory-built racing engines with which we have direct experience run better when their spark timings are slightly retarded. Typically, too, their spark plugs are one heat range too cold and they're jetted a bit rich. Also typically, these same bikes are fitted with even colder plugs, richer jetting and sometimes are given more spark advance by those who buy them. The worst, most destructive, combination of mistakes we see begin with two widely-held assumptions: first, that a cold spark plug will help fend off that old devil detonation; second, that more spark advance -not less- is the thing to try when reaching for power. Try to use a too-cold spark plug and you very likely will have to jet for a lean mixture to avoid plug fouling - and as you lean an engine's air/fuel mixture down near the roughly-14.5:1 chemically-correct level it becomes extremely detonation-prone. Excessive spark advance is even worse in its ability to produce detonation, and when combined with a lean mixture it's enough to quickly destroy an engine. Most people who've had some experience with racing bikes (especially those with two-stroke engines) know that detonation is a piston-killer. Few really know the phenomenon for what it is: a too-sudden ending to the normal combustion process. You may imagine that the ignition spark causes an engine's mixture to explode, but it actually burns. There's a small bubble of flame formed at the spark gap when ignition occurs, and this bubble expands - its surface made a bit ragged by combustion chamber turbulence - until all the mixture is burning. This process begins slowly, but quickly gathers speed because the mixture beyond the flame bubble is being heated by compression and radiation to temperatures ever nearer the fuel's ignition point. When the initial spark is correctly timed the spreading flame bubble will have almost completely filled the combustion chamber as the piston reaches top centre, and all burning will have been completed by the time the piston has moved just a millimetre or two into the power stroke. But the final phase of this process can be shifted from simple burning into a violent detonation of the last fraction of the whole mixture charge. Starting the fire too early will produce detonation, as it gives the mixture out in the chamber's far corners time enough to reach explosion-level temperature. And a slightly lean mixture detonates at a lower temperature. It's all a function of ignition timing and mixture in any given engine, and spark plug heat range plays absolutely no part in it. Your engine's spark plug doesn't cause detonation but it can tell you when and why the phenomenon has occurred. Moreover, the spark plug can tell you with remarkable precision how much spark advance and what jetting your engine needs. Those are things you can " read" in a spark plug, and all that is written there will be revealed very clearly when the heat range is right. So how can you tell whether you've chosen the right heat range? It's easy: a spark plug should be getting hot enough to keep its insulator nose completely clean, with all deposits burned away, but not so hot that its electrodes show signs of serious overheating. These are things to look for on a new plug that has been subjected to a few minutes of hard running. After many miles of service insulators acquire a coating of fuel deposits, with some coloration from oil in two-stroke applications, and there will be some erosion of the electrodes even when everything is normal. Don't try to read old spark plugs; even the experts find that difficult. New plugs present unmuddled information about what's happening inside an engine, and can give you a complete picture after just minutes of hard running. At least they will if they're running hot enough, and that should be hot enough to keep the insulator clean. It's impossible to separate the question of ignition advance from the primary evidence of spark plug overheating, which is most strongly shown on the plug's centre electrode. If you inspect this electrode's tip with a magnifying glass and see that its edges are being rounded by erosion, or melting, then you know there's overheating. You should also have a close look at the tip of the ground electrode, checking for the same symptoms. Finally, inspect the condition of the insulator, which should be white but with a surface texture about like it was when new; a porous, grainy appearance is evidence of overheating. If the signs of overheating are confined mostly to the centre electrode you can bet you're using too much ignition advance. Retard the spark timing in small (two or three degrees) increments and as you get close to the optimum advance you'll find two things happening: first, the whole plug will be running colder; second, the centre electrode will begin to acquire a film of fuel deposits extending out from the insulator nose toward its tip. The fuel film mentioned here is what you watch when making fine adjustments in ignition advance. In an engine that's been given just a few degrees excessive advance (as most have) the fuel film will only extend outward along part of the centre electrode's exposed length, ending abruptly a couple of millimetres from the tip. The portion remaining won't be filmed over simply because it has been hot enough to burn away the fuel salts dusted on the rest of the electrode, and you'll see that sort of localised overheating created by too much spark advance even on a plug that is two or three heat ranges too cold. And you'll have the correct spark advance when the centre electrode's fuel film continues right out to within a hair of its tip. There are a couple of caveats to be observed in this matter. An overly-retarded spark timing won't show except as an absence of any evidence pointing to too much advance. Also, the spark itself will blast clean spots in the electrode's fuel film, and when there's enough combustion chamber turbulence to blow the spark sideways into a curved path you'll get a cleared area on one side of the electrode. This lop-sided spark blush shouldn't be mistaken for the more sharply defined ring associated with the electrode tip overheating produced by excessive spark advance. Once you have brought your engine's ignition timing close to optimum you'll almost certainly have to make a further change in spark plug heat range. Manufacturers' specifications for racing models very often advise you to use too much advance and a too-cold plug, and when you shorten the spark lead to suit commonly-available fuels it almost certainly will be necessary to use a warmer plug. Then, when you have found plugs of a heat range that will keep that insulator nice and clean you can start adjusting your engine's air/fuel mixture - a task that will be easy if you can forget everything you thought you knew about this aspect of plug reading. A lot of amateur tuners, some of whom are fairly successful, will look at some plug freshly removed from a two-stroke engine and offer advice based on the colour of the oil deposited on the insulator nose. In fact, if the plug is hot enough there won't be any colour, and if there is that still has nothing much to do with air/fuel mixture. If you think about it you'll realise that the only colour you can get from an air/fuel mixture is the colour of soot. When the mixture trapped in an engine's combustion chamber has more fuel than can be burned with the available air, then combustion will be incomplete and the excess fuel will remain as soot, which is not brown or tan or magenta or any colour other than black. And if your engine's mixture is too rich, the sooty evidence will be present on the spark plug's insulator, in a very particular area. You won't find any soot out near the insulator nose, on a plug that's running hot enough to keep itself from fouling, because temperatures there are too high to let soot collect. But the insulator is much cooler deep inside the plug body, and coolest where it contacts the metal shell, which is precisely where you " read " mixture strength. Look far inside a plug, where its insulator joins its shell, and what you'll see there if your engine's mixture is too rich is a ring of soot. If this ring continues outward along the insulator to a width of even a millimetre you can be sure the mixture is rich enough to be safe, and too rich for maximum output. In most engines best performance is achieved when the mixture contains only enough excess fuel to make just a wisp of a " mixture ring " on the plug insulator. Air cooled two-stroke engines often will respond favourably to a slightly richer mixture, which provides a measure of internal cooling; some four-stroke engines give their best power when the mixture is leaned down to such extent that the last trace of soot deep inside the plug completely disappears. Never try to jet too close to a best-power mixture until after you've taken care of spark advance. As previously noted, the air/fuel ratio that yields maximum power is only a shade richer than the one that is most detonation-prone; fortunately, the plug will tell you when there has been even slight detonation inside your engine. The signs to look for are pepper-like black specks on the insulator nose, and tiny balls of aluminium concentrated mostly around the centre electrode's tip. Severe detonation will blast a lot of aluminium off the piston crown, and give the plug a grey coating-which is a portent of death for the engine. A few engines will show just a trace of detonation when jetted and sparked for maximum power, but that never produces anything more than a few minuscule spots of aluminium gathered on the centre electrode's sharp edges. If you see more aluminium and an extensive peppering evident on your plug, you're in trouble. We cannot stress too strongly the need to give spark advance your closest attention, because excessive spark lead is the most frequent cause of detonation, which is a real engine killer. You can't stop advance-produced detonation with a cold spark plug, nor with anything but a wildly over-rich mixture. Also, excessive ignition advance has a bad effect on performance. We ran a 250cc road racer at the drags a few months ago, and found that retarding the spark about five degrees from the manufacturer's setting raised the trap speed from 106 to 110 mph. Similarly, there's a 125cc Motorcross machine residing in our shop which runs a lot stronger and cleaner since it has been retimed for less advance, jetted leaner, and been given a hotter spark plug. Even touring bikes sometimes benefit from revised spark timings. Only rarely will their carburettor be off enough to need attention, but the ignition advance they get represents a compromise between the optima for power and economy. For some riders, especially those who use a lot of throttle much of the time, stock ignition advance is too much advance. And of course many riders find that their specific requirements are better met with non-standard plug configurations. The trick in all this is to know enough about spark plugs to be able to choose the right basic type, and to understand what the plug has to say about conditions inside your bike's engine. It's not an altogether easy trick to perform, with so many things to be remembered all at once; it's a terrifically effective trick when you get it right.